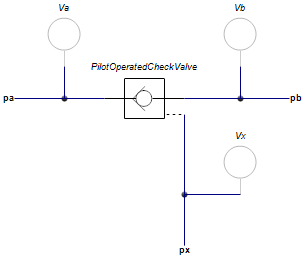 This model is a pilot operated check valve with parasitic volumes. The pilot ratio kp is ratio of the pilot piston area and the check valve area. For a large pilot ratio a relatively small pilot pressure is sufficient to open the valve against a large outlet pressure. Valve is closed under this pressure [Pa] and zero pilot pressure. Valve is fully open above this pressure [Pa] and zero pilot pressure.